Matthew Rhys Wins Emmy for Outstanding Lead Actor in a Drama. 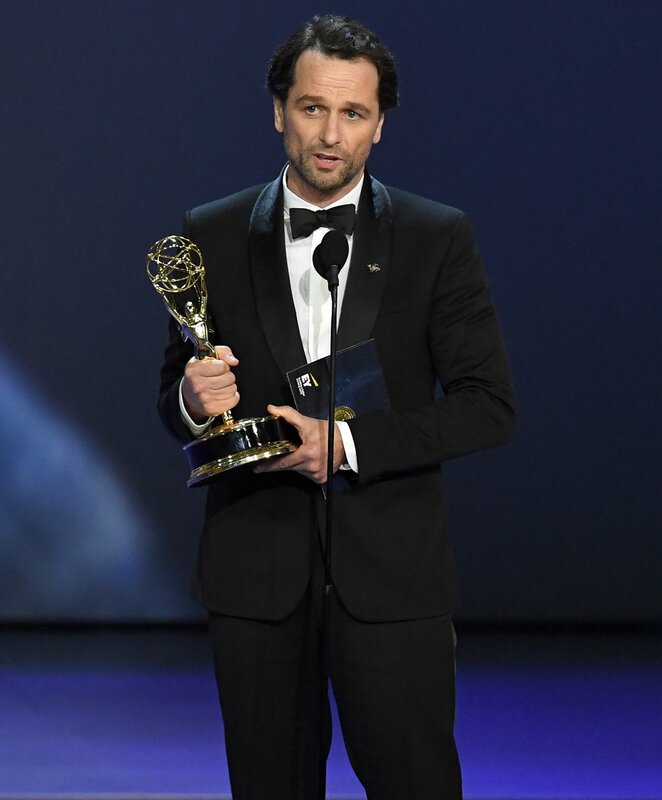 After six seasons of The Americans, Matthew Rhys Hollywood & Trust PA Patron (personal friend of Paul-André) finally got his Emmy win. P-A would be duly thrilled for him. Matthew Rhys 43, picked up his first-ever Emmy Award for outstanding lead actor in a drama series at the 70th Award Ceremony — and the only person equally excited as the actor, was his girlfriend and Americans co-star, Keri Russell. Keri Russell, who was also nominated for her role in the FX series, gave him a big kiss as soon as his name was announced from stage as the lucky winner. “And finally to the woman who truly got me this award, who just stands in front of me every day and puts up with me,” he continued, adding that Keri said she didn’t want Matthew to be influenced by Glenn Weiss’ decision - to use his time onstage that night, to propose to his girlfriend. She said, ‘If you propose to me, I will punch you clean in the mouth,’ ” he joked.“Thank you, more to come,” he added, in a final sweet note to Russell. This was Matthew Rhys’ first win and third Emmy nomination and all for his lead role as Philip Jennings, a KGB sleeper agent (& wife) living in the United States during the Cold War. Matthew Rhys beat his fellow nominees; Jason Bateman (Ozark), Sterling Brown (This is us), Ed Harris (Westworld), Milo Ventimiglia (This Is Us) and Jeffrey Wright (Westworld). The 70th Primetime Emmy Awards was hosted by Michael Che and Colin Jost at the Microsoft Theater in Los Angeles on 18th September 2018. This is truly a great occasion to celebrate a very good job well done as has been appropriately recognised by the artistic TV industry (see below) Everyone at Trust PA is very thrilled to hear this good news and send Matthew our hearty congratulations, with every good wish for continued success and positive recognition. The Primetime Emmy Award is a symbol of peer recognition from over 23,000 Television Academy members. Each member casts a ballot for the category of competition in their field of expertise. NB: Article & info is revised from USA & media reports.